I've had IBS since my early teens and over years of trial and error have got to a point where I'm largely symptom free. One of the things I think helps is maintaining a healthy gut flora, where I give as much help as I can to my body to maintain 'good bacteria' and suppress the ones that add to unpleasant symptoms. As well as outcompeting 'bad bacteria', a healthy gut flora helps us to extract nutrients from our food and even synthesises some including B12 (which you may not think about at all unless you are a vegan because eating animal products such as meat, fish and eggs provides plenty). Even bacteria we are used to hearing about as a 'baddy' when it's in the wrong place, in the right place is a 'good bacteria' - E. Coli is now known to produce Vitamin K in the bowel. A poor gut flora is now being linked to all sorts of health problems, including rising levels of obesity and autism (theories are wide ranging and include things such as that pesticides destroy our gut flora, high levels of sugar encourage yeast which lead to fermentation instead of digestion, kids aren't exposed to dirt to build up their gut flora etc...) . I am not a health professional and cannot comment on whether there is any truth in these claims, but it does seem a sensible idea to me that raising children who are 'cultured' (i.e. exposed to good dietary practices and microbialy cultured foods) is likely to have long term benefits to their health without having any potential downsides. This is not some weird faddy diet excluding whole food groups, it is simply adding in things that benefit a healthy gut flora and reducing the things that damage it such as processed sugar. 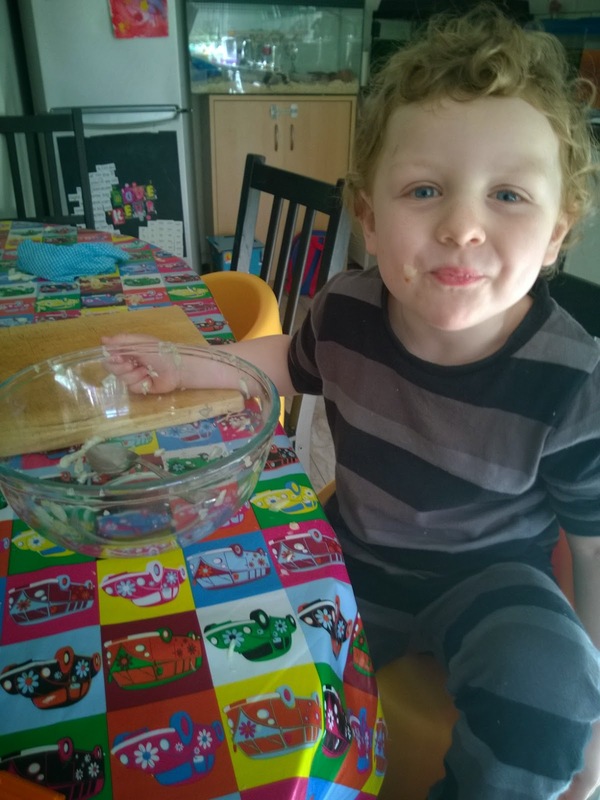 Many helpful things are likely to be already in children's diet including raw and cooked veggies, fruit and yoghurt. Others may be traditional to some diets and not others, such as Sauerkraut and fermented drinks such as Kombucha. Some helpful things are 'prebiotic' such as yoghurt and contain the useful bacteria, others are 'probiotic' and contain things like fibres which the bacteria need, e.g. inulin from chicory or bananas. Personally I don't favour the fermented probiotic drinks that are common at the moment in places like supermarkets because they contain high levels of either sugar or sweeteners, but there are plenty of alternatives. Fermented foods were likely to be a commonplace part of the diet up until recently because of the need to store food over winter before the invention of electric refrigerators. 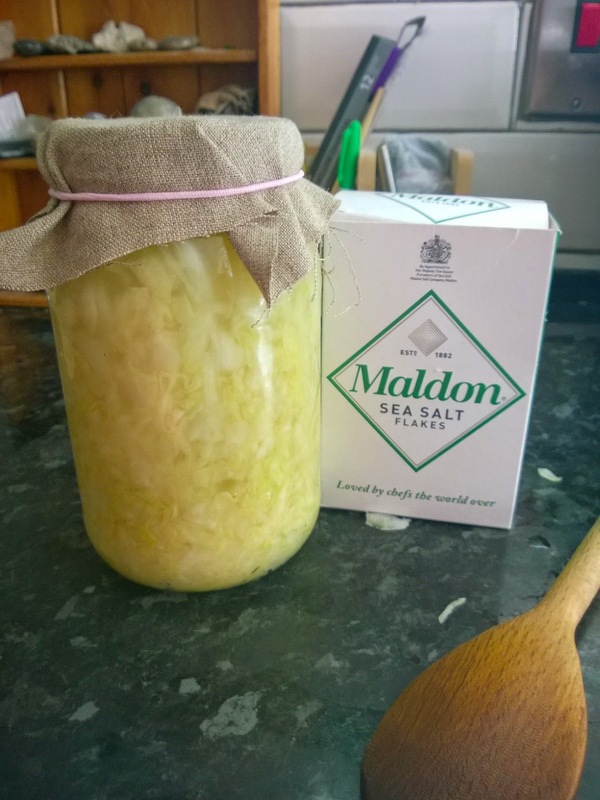 I have tried making yoghurt in the past (it sort of worked but I think I need more practice) but decided yesterday that we would have a go at Sauerkraut as a serious foray into making our own cultured food. Sauerkraut is a lacto-fermented product - when submerged in salty water Lactobacillus bacteria naturally present on the vegetable converts sugars in the cabbage into lactic acid, which then prevents the sauerkraut rotting. As well as the useful probiotics, sauerkraut is also a good source of vitamin C (for some reason more than cooked or raw cabbage) and fibre, and a source of vitamin K and iron. I wouldn't give mounds of it to the kids though as it is quite salty - a tablespoon is about the limit no matter how much they beg for more. I tried Sauerkraut for the first time years ago and hated it, but I kept trying it until lo and behold I now love it. To their credit the kids took less time to be converted to it, and regularly ask for it as a side to their dinners. Ironically, the reason I wanted us all to eat it in the first place was probably lost in translation because I was buying it in jars from the supermarket, so it was likely to have been pasteurised - heat treated to kill bacteria. The solution is to have a go at making our own. Sauerkraut is in theory easy to make, being just cabbage and sea salt. I used the instructions on this website as it seemed the simplest and didn't involve complicated equipment or mounds of cabbages. 1) With clean hands and equipment we shredded one white cabbage (I washed the outer leaves and saved them for later in the process). 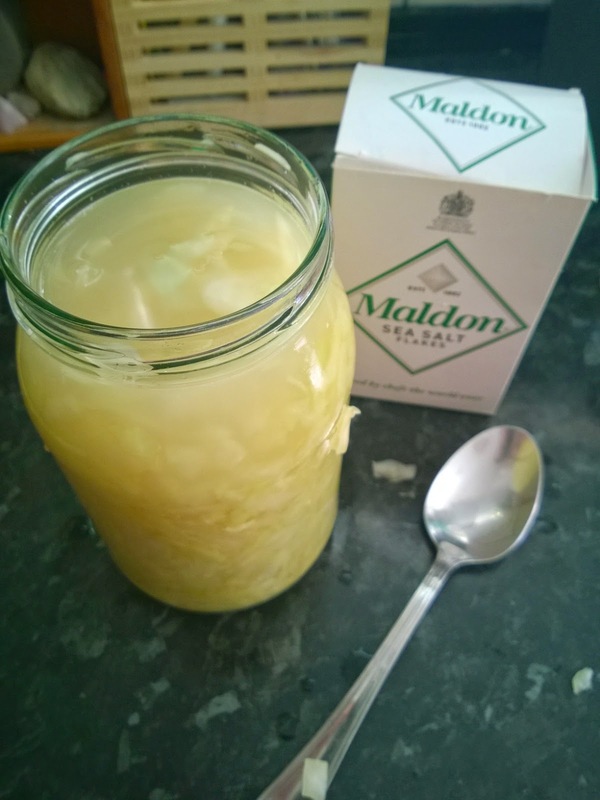 2) Then added a tablespoon of sea salt and spent about ten minutes scrunching the cabbage up until it went limp and yellowed a little - the aim is to break up the plant cells to release the sap. You will be able to squeeze liquid out from a handful. 3) Pack down as tight as possible into a big jar (or several smaller ones) - I used a spoon to repeatedly ram it down. You want to get out all of the air bubbles and make sure all the cabbage is submerged. 4) The recipe suggested weighting the top with another smaller jar full of marbles to prevent any cabbage floating. I deviated and used washed cabbage leaves cut to fit to top it off, I'm expecting to need to remove and replace these every couple of days as they go slimey so the jar thing is probably better. 5) Top with a clean piece of fabric, not a sealed lid - the aim is to keep out insects and dust while allowing air flow. The recipe suggests pressing down again every day until all the bubbles are definitely out and topping up with liquid if there isn't enough to cover. The minimum given is 3 days fermentation, with 10 days or even after that (some recipes suggested a month as a minimum and several months for connoisseurs). When it tastes 'right' screw on a lid and keep in the fridge. If it smells wrong it probably is, discard it. 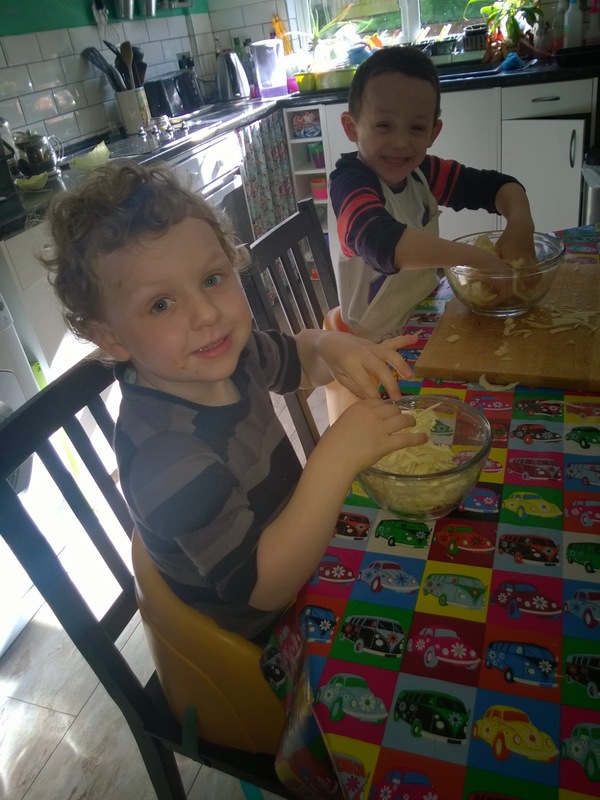 I have no idea if this will work or not, but it was a good fun sensory activity in the meantime and for very low cost. 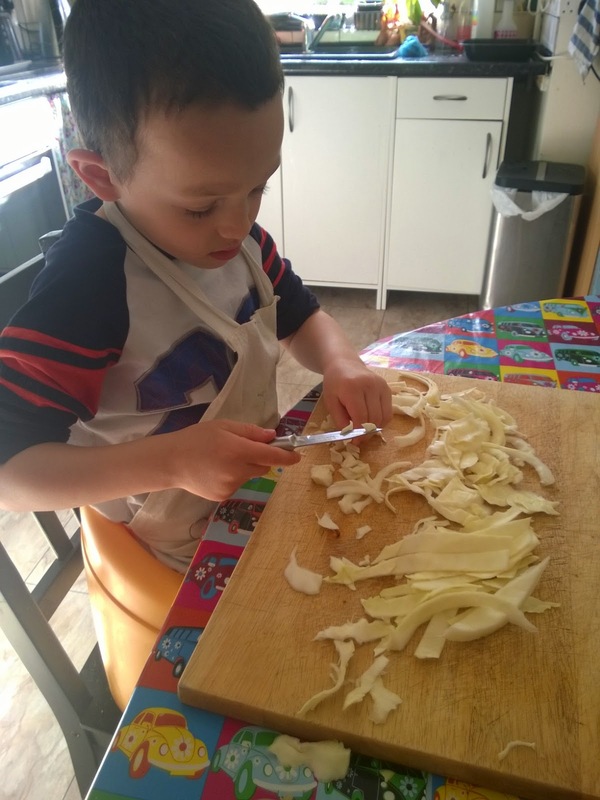 Toby certainly enjoyed helping clean up the leftover cabbage shreds. Wish us luck in our fermentation experiment and do look up the original recipe here for the advice from an experienced source!